Up to 30,000 bees make a parabolic comb in the tualang tree, that towers up to 30 stories above the jungle floor in Indonesia. Its the 3rd tallest tree in the world! This is where we go to harvest a rare treat, Beach Organics raw Black Jungle Blossom Honey. We take up to 20% of the honey crop, minimising disturbance to the largest honey bee in the world! Its a sustainable harvest and this honey has a UMF 25+. 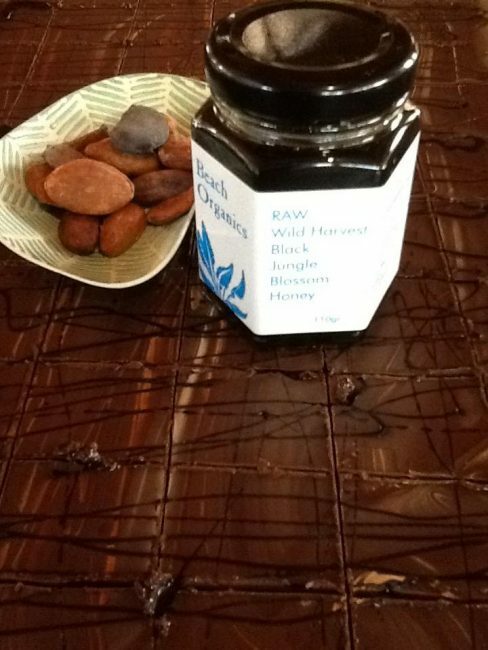 When the guys from Tasting Australia recently asked us to make a small batch of our organic raw chocolate, it seemed a perfect marriage of flavours. Our customers can relish this unique combination, but only when you swing past our Store at PLANT 4 BOWDEN! See the range of our special raw honeys here in our Shop Online.